Why choose Steven Cleary Carpentry for your child’s bedroom furniture? The only limit is your child’s imagination: Steven Cleary Carpentry can help you to create an imaginative bedroom for your son or daughter. Illustration by Olga1818 (via Shutterstock). Steven Cleary Carpentry’s bespoke approach to furniture design is well suited to bedroom design. Especially where children’s bedrooms are concerned. 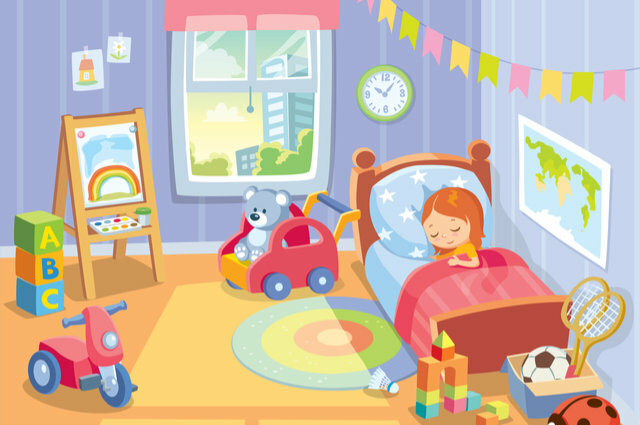 We at Steven Cleary Carpentry are able to work with you on your child’s bedroom, with a choice of furniture that is easy to clean as well as hardwearing. This includes beds, wardrobes, and drawers. As well as getting the basics right, we can also work on the embellishments. For example: basing your child’s bedroom around his or her interests. These could include images of racing cars, fantasy scenes, or characters from popular TV shows and films. For example: Walt Disney characters such as Mickey Mouse or the characters in Frozen; or the dogs from PAW Patrol. To make this possible, we shall discuss your requirements in our initial consultation. Then we can give you a free no-obligation quote and – if you like what you see – go ahead with the work. We understand that a child’s needs may change over time. They might want to replace their PAW Patrol stuff with pictures of their favoured pop musicians (instead of Zuma, possibly Justin Bieber or Ed Sheeran). As they get older, they would want space for a desk to do their homework. Not least the space for the all-important computer and its peripherals. If you have any queries about our handiwork, contact us on 046 9028374 (landline), 086 2448792 (mobile), or via email through clearycarpentry@gmail.com. Our builders in Dublin will be happy to discuss your requirements and help to plan your child’s dream bedroom, as well as offer you a free no obligation quote. Steven Cleary Carpentry, 17 August 2017.